From airport 80 Km. Florence Airport "Amerigo Vespucci"
From city center 27 Km. From public means 1 Km. The Castle and the surrounding estate were originally owned by the Bargagli family, an ancient and noble family of Siena. With account books in the possession of current owners dating as far back as 1680, we have an overall vision of the events that influenced the economy and culture of farm life in Tuscany.The Castle became home to movie stars and Italian nobility in the 1960s; most notable Luchino Visconti, a renowned Italian filmmaker. He lived in the Castle with Austrian actor Helmut Berger, of “Godfather III” and his brother. Visconti, who is best known for his work on the 1963 film “The Leopard,” worked with stars such as Burt Lancaster and Marcello Mastroianni. He lived lavishly at the Castle, frequently hosting the jet-set. The Description A Timbers Resort and member of Preferred Boutique, is a five-star resort and residences in Tuscany, Italy. 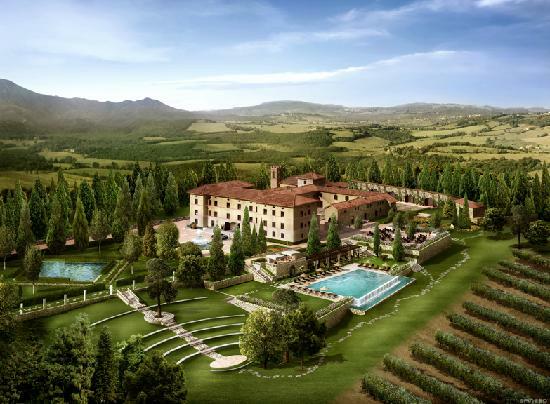 The historic 4,200-acre estate features 28 artfully restored and reconstructed Tuscan farmhouses, and a 41-suite boutique hotel complete with a world-class spa and wellness center, swimming pool, pizzeria, stylish bar, visionary fine- dining and casual restaurants, 10 hotel villas, and a stately penthouse. The estate is also home to a model game preserve, 88 acres of vineyards, 13 acres of olive groves and an expansive trail system. The Description Special focus is on homemade pasta and local meats highlighted with fresh local produce from the hotel‘s gardens. In season, fresh game including wild boar, venison, pheasant, hare and rabbit are featured. Freshly grilled seafood dishes drizzled with the estate’s extra virgin olive oil are also a specialty. The Tosca Restaurant Ristorante Tosca provides interior seating for 70 people and has a contemporary feel with dramatic inlaid marble flooring, restored stone walls, and custom Murano glass chandeliers. The outdoor dining terrace, which seats up to 120 people, overlooks the town of Casole d’Elsa and the hotel’s vineyard. Special focus is on homemade pasta and local meats highlighted with fresh local produce from the hotel‘s gardens. In season, fresh game including wild boar, venison, pheasant, hare and rabbit are featured. Freshly grilled seafood dishes drizzled with the estate’s extra virgin olive oil are also a specialty. Pazzia Restaurant Pazzia, Italian for Madness, is the property’s casual eatery and includes seating for up to 30 people, an espresso bar, gelateria and wood burning pizza oven. This traditional Tuscan space has an interior of exposed brick and antique light fixtures with a Carrara marble pizza counter and an assortment of antique tables and chairs mixed with banquettes. The relaxed atmostphere is an ideal location for coffee, tasty salads and panini, freshly made pasta dishes and Tuscan specialities, brick oven thin crusted pizza, or homemade gelato. THE ROOMS Suites have a refined and sophisticated style and feel. The rich color palette of the suite is inspired by Tuscany’s classic hues such as terra cotta, soothing blue and cypress green. Wood beamed ceilings and plastered wall finishes frame each of the suites, which are appointed with local antiques, comfortable upholstery in vibrant Italian fabrics. Bathrooms feature natural daylight and Carrara marble or mosaic bathroom flooring, classic bath fittings and antiqued mirrors. The Suite Studio Suites have a refined and sophisticated style and feel. The rich color palette of the suite is inspired by Tuscany’s classic hues such as terra cotta, soothing blue and cypress green. Wood beamed ceilings and plastered wall finishes frame each of the suites, which are appointed with local antiques, comfortable upholstery in vibrant Italian fabrics. Bathrooms feature natural daylight and Carrara marble or mosaic bathroom flooring, classic bath fittings and antiqued mirrors. Suites range from 37 to 40 square meters / 398 – 430 square feet. The Bargagni Penthouse The Bargagli Penthouse is located on the top two floors of the Main Villa. The three bedroom, two-story penthouse has a spacious private terrace that opens up to commanding views of the nearby hill towns of Casole d’Elsa and Mensano. Inside, reclaimed wood-beamed ceilings, stone walls and hand-plastered finishes have been gently restored and modern amenities have been added. Rubelli fabrics grace the upholstery, dramatic Fontana Arte lighting softly brightens the spaces, and in the baths, Dornbracht and Boffi fixtures add gleaming elegance. The Bargagli Penthouse is 2,265 square feet for the two-bedroom layout and 3,350 square feet for the three-bedroom layout. The Description Essere, Italian for To Be, is a 5,400-square-foot spa and wellness center, which features seven treatment rooms, relaxation areas with dramatic water features, steam rooms, pools inspired by Roman baths and luxury locker rooms and a large state-of-the-art TechnoGym fitness facility. In addition, Essere Spa includes an outdoor garden terrace for yoga and Pilates, a relaxation area in a private outdoor garden, and wet and relaxation areas. Renowned Italian company Comfort Zone provides consulting on the treatment menu and signature products, incorporating hints of olive oil, grape seeds and skins, rosemary and other ingredients indigenous to the Tuscan region. The Description In Castello di Casole, vows softly rise to the heavens in the historic Chiesa S. Tommaso Church, newly restored to host intimate gatherings and celebrations for up to 30 guests. For larger events with up to 200 attendees, a picture-perfect ceremony among the vineyards or in any of the pristine outdoor spaces will be forever remembered. The guests have to book a minimum of 15 suites, too. The Description Castello di Casole offers a number of authentic classes for those who want to enjoy the local culture during their stay in Tuscany. Our instructors, all born and raised in Italy, will help you learn to make homemade pasta and other Italian foods; speak Italian like a native; and create amazing works of art. 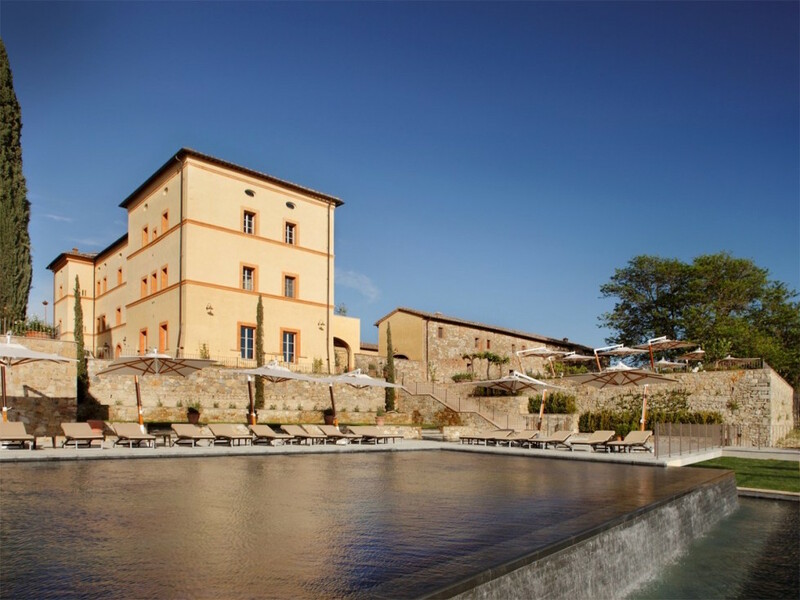 Enrich your life during your next stay with these fun classes on the Castello di Casole estate, held in the privacy of your villa or hotel suite, or in one of the inspiring spaces throughout the property.